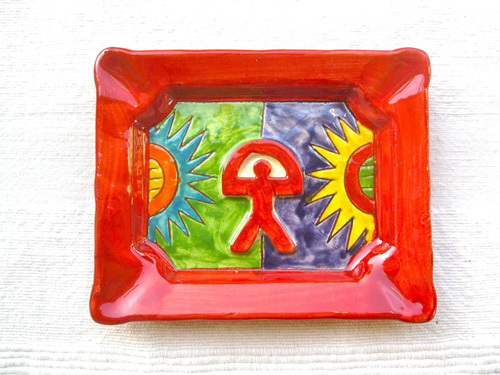 These dazzling oblong handmade Spanish dishes / ashtrays feature the lucky Indalo symbol and are decorated with a blaze of rich, vibrant colours, each individually handpainted in Andalucía, southern Spain. They are made from the local clay of the Alpujaras and have a lovely rustic quality. What a stunning gift with meaning to give a friend or loved-one - as well as adding a little flavour of the Mediterranean to their home or office. This sweet little ceramic was designed principally as an ashtray but we feel that the colours and designs are so vibrant and have such a "Mediterranean" feel, that it could easily lend itself to other uses - even for non-smokers . . especially for those with an interest in the Indalo symbol. Description: The ashtray / little 'dish' measures 13x10.5cms (5x4"). Because they are handmade, each dish is unique. An ideal present for a housewarming party or new home with a multitude of uses. Even if the recipient is a non-smoker, it is handy to have for guests (and it has other uses, too eg: as a soap dish) and would make a practical gift to pass on your best wishes. A nice little retirment pressie too. Comes gift-wrapped, like all our presents (with an information card about the Indalo) - and we can print a personal message on your behalf.